CLUB REPRESENTATIVE CODY KAZAKOFF SEARCHES for synonyms while writing a motion regarding Rensselyrics’ actions. The Executive Board held its second meeting of the year last Wednesday; it included the “punishment” of the Rensselyrics for neglecting financial policy and revisions of the policies regarding room reservations and events. Archibald explained that the Rensselyrics had wanted to record a CD for a while, and that their goal was to have one finished by the time the seniors in the club graduated. In the Spring Semester of 2018, Rensselyrics met with their Student Activities Resource Person Ben Young to “start that dialogue up early.” They planned to raise money with weR Gold, use that money to pay for the first half of the CD, and then ask the Executive Board for the remainder of the money to complete the project. Rensselyrics then began speaking with Plaid Productions in April 2018 and recorded with them on April 22. Rensselyrics passed along the invoice for the recording to Young, who was unaware that the project had even begun. The invoice totaled around $3,300. On June 15, 2018, Rensselyrics was notified that the invoice was paid for by the Union, out of the club’s gift account and with no subsidized funds being used, but that no more work was to be done with Plaid Productions until the group met with the Executive Board. During the Board’s discussion without Rensselyrics members present, the general consensus was the intentions were good, that they had a poor understanding of financial procedures, and that this should be an educational experience. An initial motion regarding the situation, after its many amendments, would have required Rensselyrics to come back before the Board within six weeks to “update the Board about communication efforts with Union Admin Staff [and] their E-Board Rep,” have the group “create a financial presentation in partnership with Union Admin Staff [and] their E-Board Rep for their organization,” and “freeze usage of their budget” for Fiscal Year 2019 until the provisions of the motion were fulfilled. This motion eventually failed with a vote of 6-9-1 after discussion. A motion to place them on probationary status until the Club Operations Committee “deems the club has gained a sufficient understanding of Union finances” was later passed with a vote of 15-0-1. This was moved by Business Operations Chairperson Brian Mansaku. “We have policies already for situations like this, when a club makes a mistake or there’s a misunderstanding, anything like this. It’s called probationary status,” Mansaku expressed. He then explained that when a club is placed on probationary status, all of their purchases must be approved by their SARP anyway. Despite Mansaku’s argument, the Board still opted to “rescind” Rensselyrics’ $500 budget for recording for Fiscal Year 2019. This motion was passed 9-3-4. During the president’s report, President of the Union Justin Etzine encouraged individuals to come forward and criticize or question him if they had doubts or issues about his leadership. Policies Committee Chairperson David Raab also presented the first of many Executive Board policy changes. A restriction on the number of food-based fundraisers that a club can do in a semester was added to the Room Reservation and Events Policy. Director of Student Activities Cameron McLean explained that this was because, according to New York State law, when an organization does more than 14 food-based fundraisers they are legally considered a business. 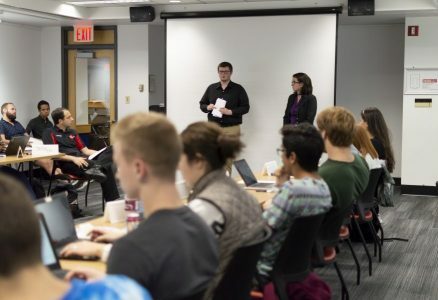 The policy sets the limit at 10 per semester, as is it allows about one fundraiser per week, excluding the time coming back to campus and the weeks around finals. The motion to approve these changes passed 15-0-1. Changes to the Sign Policy were largely grammatical, but also added a section on how to handle exceptions to the policy. These changes passed 15-0-0, pending approval of the Senate. A representative of UPAC Sound came before the Board and explained that the club had no place to meet, due to some error with the scheduling service, and there were no spaces available. Their request to use Mothers Wine Emporium on Mondays from 9-10pm was passed unanimously. A motion to approve Etzine’s appointment of Dragana Dragutinovic as the Multicultural Leadership Council Chairperson passed unanimously. Another motion was to approve Etzine’s appointment of Club Operations Chairperson Caitlin Kennedy as a member at large of the Executive Board; this would allow Kennedy to make motions so that she could work as the Club Ops chairperson more easily—a logistic which was initially overlooked. The motion to approve her, pending Senate confirmation, passed unanimously. The Executive Board meets every Wednesday at 7 pm in the Shelnutt Gallery.